Citizens Bank, a fixture of the northeastern United States, is a prize asset. And its owner, RBS, could be a forced seller. In theory, that should mean a bidding war if the taxpayer-owned UK bank decides to sell. But the need to pay cash, keep their own investors happy and satisfy watchdogs may give buyers pause. The U.S. bank’s $120 billion of assets, $97 billion of deposits and $82 billion of loans, mostly in New England, would appeal to a number of regional U.S. banks from similarly sized institutions like Fifth Third and BB&T to larger rivals like PNC and US Bancorp. Then there are the Canadians – TD Bank is a prominent and expanding player on the U.S. East Coast. Having plenty of potential bidders ought to make a sale appealing to RBS, which could do with more capital under tougher Basel III rules and can no longer afford global ambitions. Citizens’ core operations only earned an annualized return on equity of 8.1 percent in the first nine months of this year. But that was better than crisis-related losses in previous years. An improving bottom line plus willing suitors ought to mean Citizens could fetch a price higher than its tangible common equity – some $11.8 billion in 2011. Bidders with overlapping operations might even be able to offset most of that outlay by cutting, say, a third of Citizens’ $3.6 billion annual expenses. After tax, savings on that scale could have a present value to the buyer of some $7.5 billion. But paying for the deal is a problem. The UK would surely want RBS to collect cash, not simply swap ownership of Citizens for shares in another bank. To raise the money, any of the logical buyers would have to sell so much new stock that it would increase share count by at least half. For the right deal investors would lap up new shares. But that highlights another hurdle. Bank shareholders have gotten used to M&A deals where the buyer pays less than book value, regardless of cost savings. Against that recent history, Citizens could seem expensive. Another possible roadblock is U.S. regulators. They’re reluctant to approve deals that make even mid-sized banks larger, as shown by the delay and close vote on Capital One’s takeover of ING Direct. Buying Citizens would push PNC or US Bancorp well above $400 billion in assets, for example, or bump BB&T up to $300 billion. Carving Citizens up might defuse some of these concerns. But British regulators may find it’s smart for the UK to make selling Citizens a longer-term project. 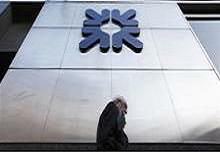 UK Financial Investments, which oversees the government’s RBS stake, has discussed strategic options with the bank including the sale of Citizens Bank, its U.S. unit. The British regulator, the Financial Services Authority, has also recommended that the bank consider selling its U.S. arm.